I come alive in March. In fact, I count off the weeks during January and February, looking forward to the day I can flip the calendar to March. Why March? Because it signals the beginning of spring. The days are longer. The sunshine is brighter. Wanting to escape, move, go somewhere warm – I added this one. Check, check and double check. Every January and February I wish I could become a snowbird – flee to Arizona and bask in the warmth. But instead, the cold gray days of the Midwest seem to multiply as 31 days in January plus 28 in February equal 500 million. But hope lies in the knowledge that seasons DO change. March DOES come in like a lion, and I will once again roar. Extra exercise, especially walking which releases endorphins. On cold days, you can find me walking around the perimeter of Target or Wal-Mart. And if the SAD gloomies persist, curl up with a good book and a heavy blanket. If you also suffer with Seasonal Affective Disorder, curl up with Hope Shines until March. My crisis may have been a byproduct of SAD – Seasonal Affective Disorder – this blasted gloominess that begins in the sky, then wraps itself around my soul. It definitely resulted from an unexpected car repair which set me back almost $700. And it probably came as a result that today is my mother’s birthday and she won’t remember it until someone reminds her. Like a pile of jagged circumstances, everything piled up and I suddenly found myself weeping – searching for hope without finding it. I wailed about the unexpected and uncalled-for circumstances that invaded my life without provocation. Unfair. Not the abundant life I hoped for. And yes, I knew all the things I needed to do: praise God, read a Psalm, play a hymn on the piano, sing, exercise. These are the same things I share with women all the time in the ministry where I work. I know what to do when despair comes knocking. But the usual formulas don’t always work to lift us out of melancholy. Sometimes we are so accosted by the darkness and the unfairness of life that we struggle to breathe and hope to stay somehow connected to what is right and true – to whatever it is that brings light to our distressed souls. This time I had to force myself to persevere – to make myself drive to church and answer the same question we all hear every Sunday and so glibly answer – sometimes falsely. Then the teacher of our class made a statement that gave me a direction where I could pursue hope. I copied the sentence and spent the rest of the hour doodling around it, grateful for its truth. Ah – yes. The character of God is good. He is love. His faithfulness is wrapped in a new batch of mercy every morning. He is the same today as he was a year ago and will be decades from now. Although I could not, dared not try to find my way out of my hole all by myself, I knew that the character of God would somehow rescue me. Because that is his job description. The Great Rescuer of Mankind. The one and only one I can solely depend on – even when I can’t feel him. And that is the crux of it. Hope is not always easy to feel. It is that ethereal cloud beyond the present and tomorrow that helps us believe life will somehow get better. And the only reason we can hang on to belief is because our faith is built on nothing else than the Savior who came to earth and showed us God Himself in flesh and bone. It still took several days for me to claw my way back to hope but at least I finally had a rope to cling to. That statement about faith helped me look beyond my mother’s Alzheimer’s, beyond the car problems and beyond the grey skies to find the light encircling my Savior’s heart. 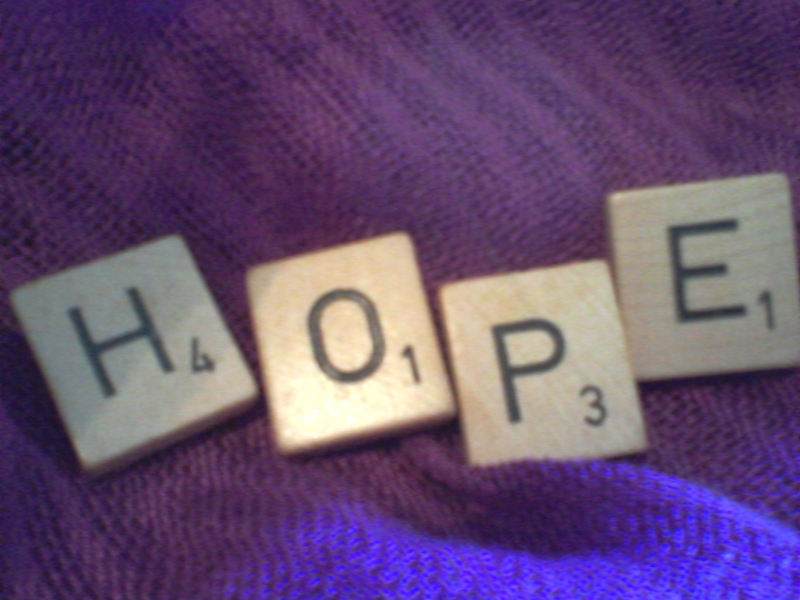 Because the tagline for my blog is “Finding hope when life unravels,” lately I’ve pondered a bit about how to find hope. Perhaps it is a response to the death of Robin Williams and how fragile life can be. Why couldn’t Robin find hope? How do any of us define and pursue hope? Besides writing and coaching, I also work at a nonprofit for women, GateWay of Hope, where we help to transform the lives of hurting women. We counsel them and provide support groups. We coach them forward in life and pray with them. In the process, they find hope. It has been said that we cannot live without hope. I have seen hopelessness in the eyes of Alzheimer’s patients as they stare forward into some invisible memory, lost within the befuddled plaque of their diseased state. They are still breathing, but they are not alive. None of us wants to get to that point and none of us wants our ending legacy to be a dangling rope, alone, in a closet. So how do we stay in hope? How do we find hope when it hides behind the darkness? Is there a formula for finding hope? Because I struggle with SAD (Seasonal Affective Disorder), the winter months are difficult for me. I’m okay during November and December because I’m looking forward to the holidays, family time and lots of chocolate. But January and February wear me out. The temperature is cold and the sky is ugly gray. I’m tired of shoveling snow and dodging ice and wish I could be one of those snow birds that rides out the winter in Arizona. Read. Finding hope, for me, means escaping into other worlds through the pages of books. I keep a stack of books in my bedroom, another one in my office and a stack on my desk at work. I am constantly reading two or three books each week – nonfiction, self-help, fiction, memoir, the Psalms – anything to keep the cells of my brain alive and thinking about something other than the gray sky outside. Pray. When I wake up in the morning, as I drive to work, in between appointments at work, before meals, at night, for extended periods on the Sabbath – prayer is my connection to the Author of Hope, the only answer I have to the desperate plea of my soul for Light and Love. During the darker days of despair, the enemy of our souls comes, splattering his drivel that neither God nor anyone else cares. I believe this must be the final cry of those who end their own lives. They believe no one cares. 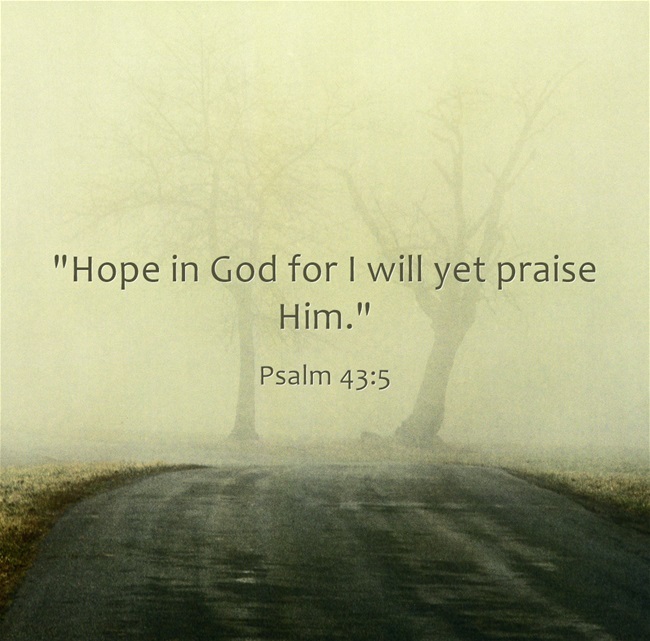 Although this tiny formula, Exercise + Reading + Prayer = Hope provides the morsel I need – ultimately, hope is one of those nebulous qualities that ends up as a gracious gift from the Giver. For those who live in the deep hell of depression, for those who struggle with SAD and for those who just feel desperate at the end of a long day – we can only cry out and ask God to gift us with a nugget of hope. Out on my deck, I consider the last gasp of summer – this season I enjoy with its plantings and harvests, its colors and textures. In my gratitude journal, I record the sights and sounds so that in the cold misery of winter – I will not forget what my heart is now thankful for. A baby cardinal, his downy feathers fluffed as he learns to fly. Deep purple campanula that hangs over my terra cotta pot, a reminder of New Mexico and the Southwest colors I love. Tinkling wind chimes in the briefest of leftover wind. Relentless sunshine – a heat advisory now but in the winter when I struggle with Seasonal Affective Disorder – these sweltering days will be reminders of healthier moments. A squirrel lying on the deck railing, lazily munching on seed – his own breakfast in bed. A nail that needs hammered deeper into the board – a visual sacrament to the God/man who took the nails for me. My cup of hot tea that I brewed and chose myself, grateful I still have choices and can make my own sustenance. A quickie prayer for Mom whose choices are fewer than ever within the fog of Alzheimer’s. Her choices will eventually all disappear. Sparrows who compete with chickadees for my offered seed – tiny symbols that God’s eye is on me – His own sparrow who depends on the feeding from His hand. Words and more words that illustrate the joyful flow within of the gift God gave me. In the beginning was the Word and the Word is in me. A monarch who pulsates his wings in a happy dance, sucking morning dew from the lantana I planted, hoping to attract him and his choir of butterflies. My herb garden: rosemary, thyme, chives, lavender and cilantro that provide flavor and health throughout the year, reminding me to eat what God has created rather than what man manufactures. The sunflowers that reach heavenward, moving their cheery faces toward the Kansas sky. Do we ever finish meeting with God? Even when I return inside to dump a load into the laundry, baste the marinating chicken again and steer the dust mop over dirty floors – my thoughts will float to this early morning tabernacle. I will remember how these hallowed moments prepared me for the day, somehow strengthened my resolve to be more present with God and encouraged my lonely heart. 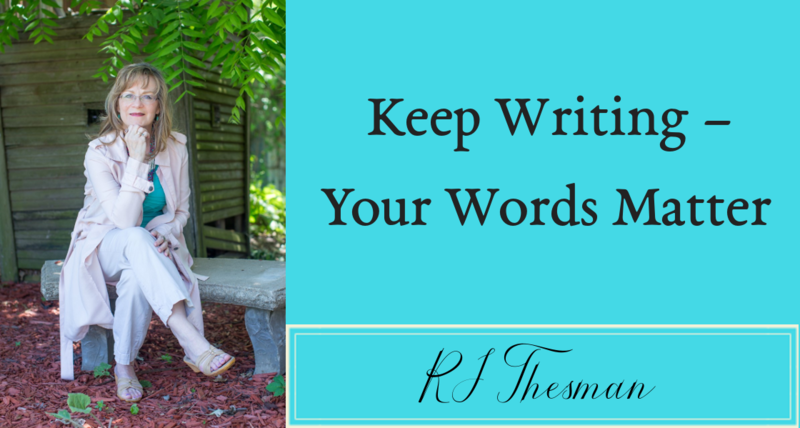 I finish writing in my gratitude journal and spin around in a final chorus of praise. My deck becomes an altar and the outside world a sanctuary. Together, the rocks, the birds, the plants and I cry out in spontaneous worship. What is it about February? The shortest month seems to stretch into a cavernous calendar of grey days. Grey isn’t my color. I don’t live well in February. 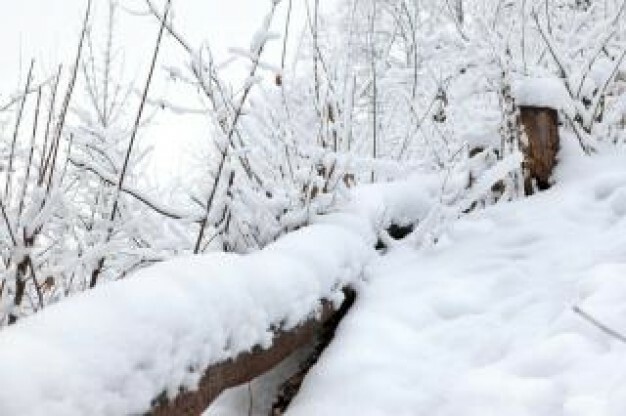 Occasional spits of snowy ice combine with frigid temperatures. We huddle tighter inside our coats, wishing for a warm blast from the Gulf rather than the icy breath of another polar vortex. Winter is my least favorite season and it seems that February stretches my barely active tolerance for winter to the limits. Every year, I struggle through it, trying to find joy and praise even while I flex my cold fingers and fight depressing thoughts. Seasonal Affective Disorder distracts me, especially during February, and I find myself sad emotionally as well as physically. Add to that a family history of several funerals during February that left emotional scars within my memory bank. I can still hear the scraping of frozen earth as cemetery maintenance tried to dig a hole for my great uncle’s casket. So what do I do to somehow find hope during February? I count off the weeks, reminding myself that somehow in March, even if we have a late snow storm – somehow the abundant life will return and the sun will shine. Grey skies will morph into blue once again. I sit in my rocker and watch the sun set, reminding myself that it’s only three more weeks, then two, then one, then a few days until the dreaded month is over once again. Every year I ask God to somehow provide me with enough money so that I can be one of those snow bird people and escape to Arizona to stay with my cousin during February. He and his wife would put me up in their spare bedroom. I know they would. If only I could get there. The “yet” will come with the next turn of the calendar. February will become March. Seed catalogs will arrive and gardening supplies will replace mittens and coats. The promise of spring will once more erupt with purple crocuses and yellow daffodils. 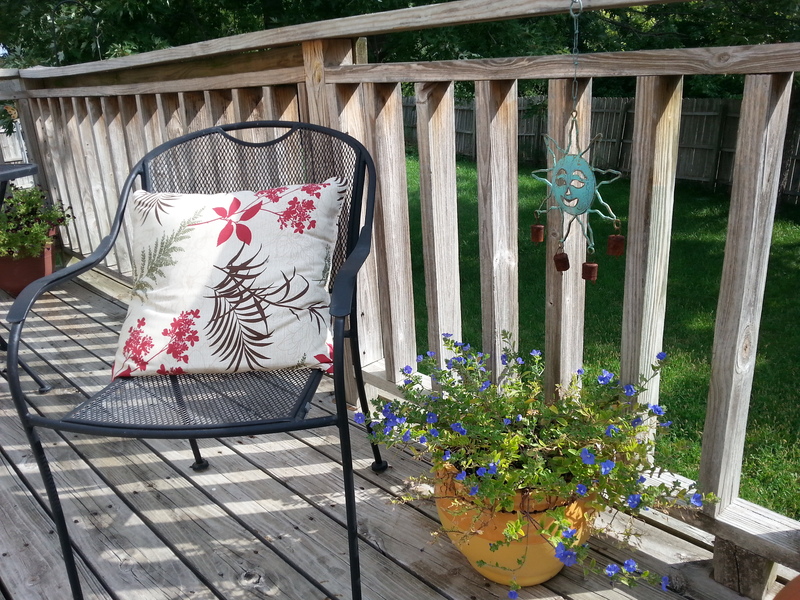 Birds will sing and I will journal in the sunshine on my deck. It is also in the “yet” that we wait for that eternal hope, when we leave the grey of this sinful earth and live in the warmth of God’s love for eternity. Surely there is no snow or ice in heaven – at least not in my corner of heaven. For me, heaven will be completely devoid of death and cold, of grey blank skies that promise only icy storms. It will be a place of eternal spring, of joy and hope, of warmth and love, of life that continues forever and ever. And I will never be cold again. Many writers have a special good luck charm that they keep in their offices or wear on their persons – anything to remind themselves to sit down and be a writer. One greeting card writer wraps a winter scarf around his neck – even in the middle of July – to remind himself of the season he’s writing about. Another writer has a special purple gel pen to use for book signings. 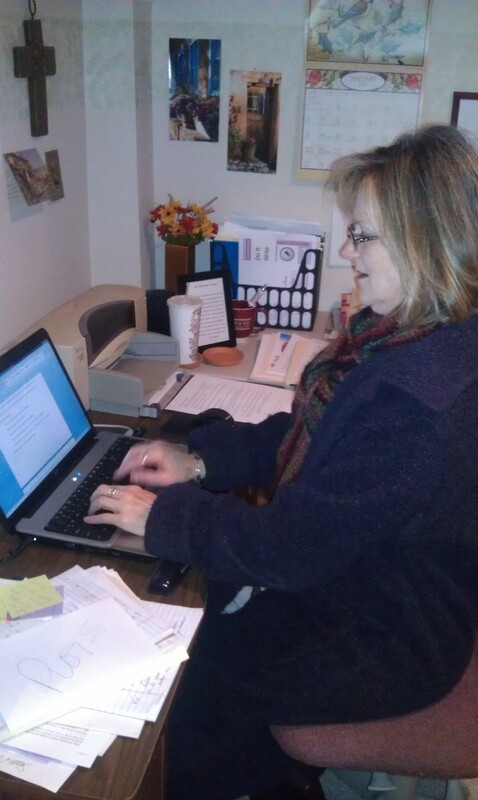 Some writers use specific chairs or make sure their desks face the rising sun. Most writers pepper their writing spaces with inspirational pictures or sayings, maybe even their special Bible verses. During the cold, dark winters – I struggle with SAD – seasonal affective disorder. The grey skies of Kansas leak icy drizzle and once I am chilled, my bones don’t warm up until the spring thaw. I enjoy the first snow, but after that – I am ready to plant flowers and sit on a sun-warmed deck. My creativity also suffers in the winter months, so I need my special good luck charm – especially during the months of January and February. Mine is not a scarf nor a specific pen, but a ratty old coat that I bought about 25 years ago. It’s a dark purple color and fuzzy warm chenille-like nubs used to cover it. Many of those nubs wore off, but the coat still provides comfort. Since my office tends to be on the chilly side – that’s what happens in old houses – I need the coat not only for warmth but also to spur on the creative side of me. With my coat on, I am Reverend G walking through the hallways of Cove Creek Assisted Living, sharing hope and encouragement with Bert, Roxie and Edith. Underneath the frayed lining of my coat, I am a blogger who shares my heart, hoping that someone will find my words informative, encouraging and worth sharing with others. With my old coat wrapped around me, I write a column for single moms and share my experiences with other single women who need just one word of hope. My coat looks odd (see photo), and I never wear it in public (except one day when I absolutely had to make a dark chocolate run to Target). I forgot about the coat until I stood in line and noticed people staring at me. Poor thing, they probably thought, she only has that old coat to keep her warm in her old age. Several times, I’ve wondered if I should give the coat away…but then, why? Nobody else would want it, while I find comfort wrapped in my personal good luck charm. So I’ll keep wearing it, and I’ll keep typing out words, hoping that my creative juices will result in something good.